Over the last month, I have had the opportunity to visit "rockfish heaven" in southern California waters, San Miguel Island. As an onboard instructor for Ronnie Kovach's Eagle Claw Fishing School, I was able to experience some of the finest shallow water rock cod fishing I have ever seen. In the two trips, the students and instructors caught full limits including a lot of big boccacio (salmon groupers), ling cod, yellow-eye rockfish, and of course, a whole mess of real nice reds (properly known as vermillion rockfish). Here is what we know about this very desirable species. DISTRIBUTION - Prince William Sound, Alaska to central Baja California. Principal area of abundance from northern California southward. Adults inhabit depths of 180 to 750 feet. SIZE & AGE - To 2.5 ft and about 12 pounds. The oldest fish (20 inches) encountered in early studies was 25 years. Recently, Milton Love was able to age "a gargantuan" vermillion at around 60 years. DIET - Small fishes such as anchovies, lanternfish, small rockfish, octopi, squids, and krill. REPRODUCTION - In southern California, spawning occurs from September to December peaking in November. In central and northern California spawning peaks in September and continues through November. As in all rockfishes, fertilization is internal. Females can then release between 63,000 and 1.6 million larvae into the water column. These larvae then enter the plankton where they spend their first three to four months. After this long larval period, the juvenile vermillions settle to the bottom in nearshore waters beginning in February. About 50% of all vermillions are mature at about 14 inches (5-6 years). FISHERY - Vermillion are very popular fish being highly sought after in both the recreational and commercial fishery where they are known simply as "reds". 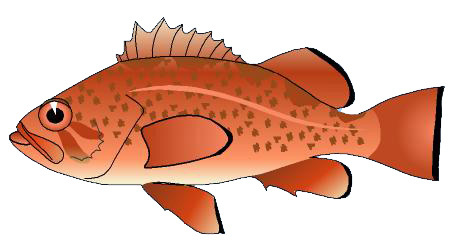 In areas of highest abundance, reds often form as much as 2-4 % of the total marine recreational catch. Intense fishing seems to have taken its toll on reds in some areas. Off central California the average size of sport-caught vermillions has dropped from 19 inches in 1981 to only 13 inches in 1989. These fish are classic "slow to grow fish" and are highly susceptible to overfishing - so let's be responsible out there!